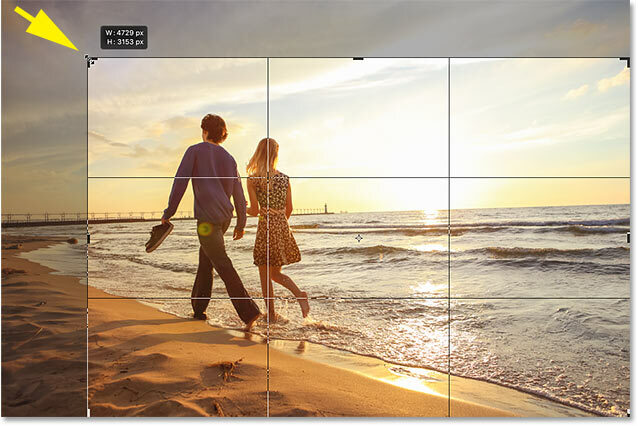 Learn the essential tips and tricks you can use with the Crop Tool to speed up your workflow when cropping images in Photoshop! but everything here is fully compatible with Photoshop CS6. Let's get started! Let's start with the Crop Tool's keyboard shortcuts. To select the Crop Tool, rather than grabbing it from the Toolbar, just tap the letter C on your keyboard. Press "C" to select the Crop Tool. 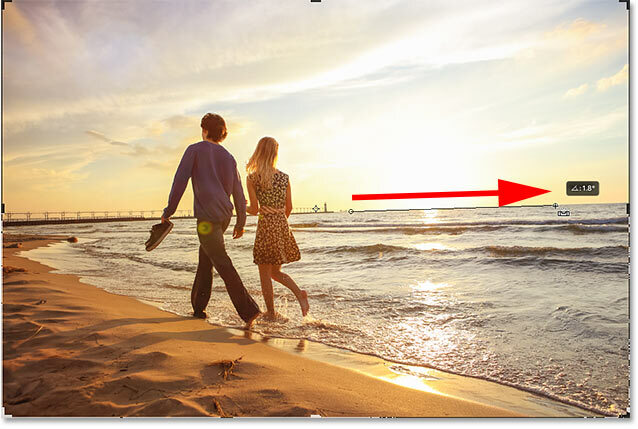 As you're resizing the crop border, you can lock the aspect ratio by holding down your Shift key as you drag a corner handle. Shift + drag a corner handle to lock the aspect ratio. To resize the border from its center, press and hold the Alt (Win) / Option (Mac) key while dragging a handle. Alt (Win) / Option (Mac) + drag a handle to resize the border from its center. And to both lock the aspect ratio and resize the border from its center, hold Shift+Alt (Win) / Shift+Option (Mac) and drag one of the corners. Shift + Alt (Win) / Option (Mac) + drag a corner handle to lock the aspect ratio and resize from center. 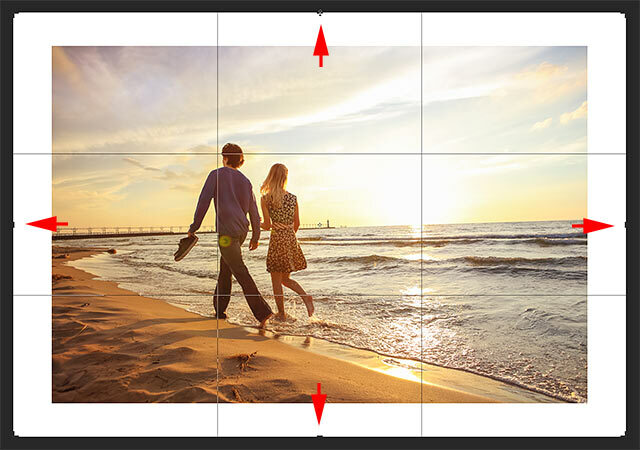 To swap the orientation of the crop border between portrait and landscape, press the letter X. Tap "X" to swap the orientation. If you want to hide the area outside the crop border to get a better sense of what the cropped version will look like, press H.
Press "H" to hide the area outside the crop border. Then press H again to bring the cropped area back. Press "H" again to show the cropped area. By default, when we click and drag inside the crop border, we move the image around inside it while the border stays in place. To move the border, not the image, you can switch to "Classic Mode" by pressing the letter P. Then drag to move the border around inside the image. Press P again to return to the default mode. Press "P" to toggle Classic Mode on and off. 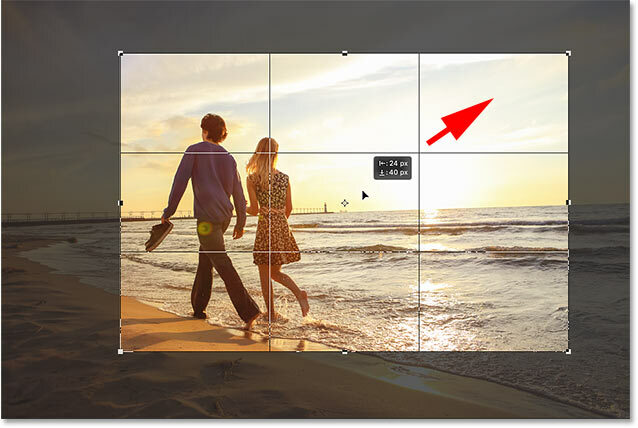 If you need to straighten your image, you can temporarily access the Straighten Tool by pressing and holding your Ctrl (Win) / Command (Mac) key while the Crop Tool is active. Hold Ctrl (Win) / Command (Mac) to temporarily access the Straighten Tool. Drag across something that should be straight, either vertically or horizontally, and then release your mouse button to rotate the image. Dragging across the horizon line with the Straighten Tool. 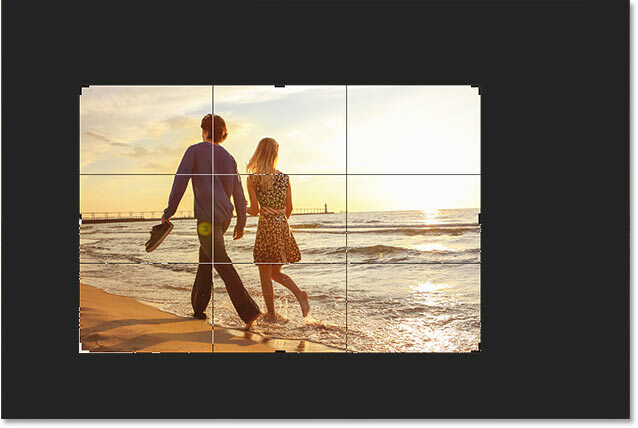 Once you've straightened the image, release the Ctrl (Win) / Command (Mac) key to switch back to the Crop Tool. Release Ctrl (Win) / Command (Mac) to return to the Crop Tool. To cancel the crop, press the Esc key on your keyboard. Cancel the crop to return to the original image. 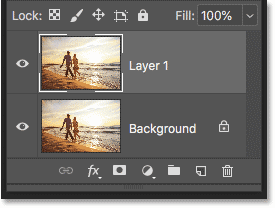 Let's look at a couple of tips to use with the crop overlay that appears inside the border. 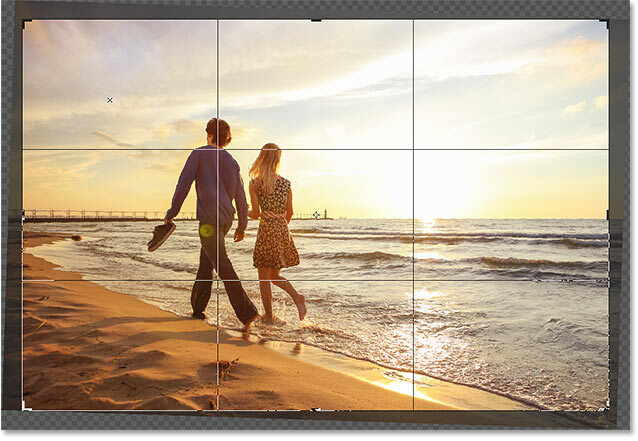 By default, Photoshop displays the Rule of Thirds overlay, which can help with our composition. 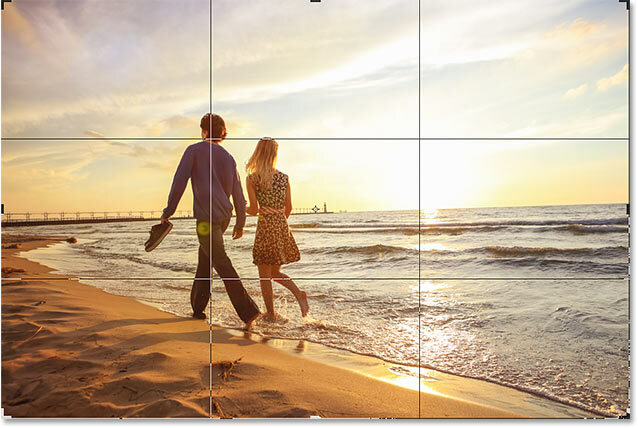 The Rule of Thirds overlay appears by default. 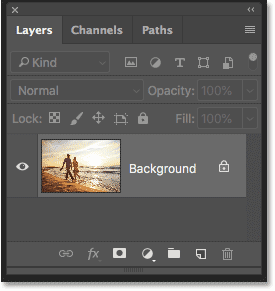 Photoshop includes 6 different crop overlays. To quickly cycle through them from your keyboard, press the letter O. Tap "O" to cycle through the crop overlays. To crop the image, press Enter (Win) / Return (Mac) on your keyboard. Or, just double-click inside the crop border. Press Enter (Win) / Return (Mac) to commit the crop. And if you need to undo the crop, press Ctrl+Z (Win) / Command+Z (Mac). Press Ctrl+Z (Win) / Command+Z (Mac) to undo the crop. 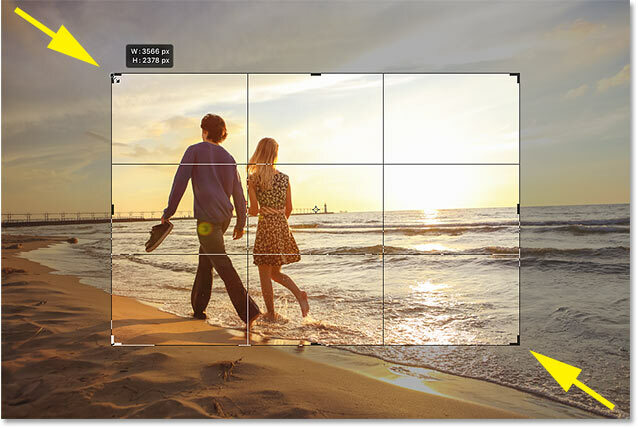 Finally, the Crop Tool isn't just for cropping images. It can also be used to add more canvas space around the image, giving us an easy way to add a border. Press Ctrl+J (Win) / Command+J (Mac) to duplicate the image. The Background color swatch in the Toolbar. Step 4: Turn on "Delete Cropped Pixels"
Make sure "Delete Cropped Pixels" is checked. 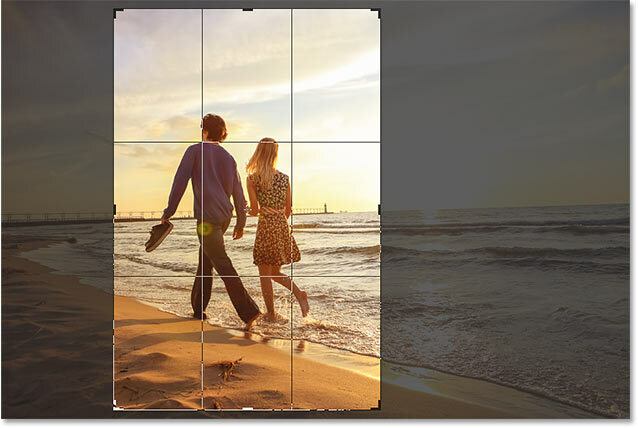 Drag the crop handles to add more canvas space around the image. 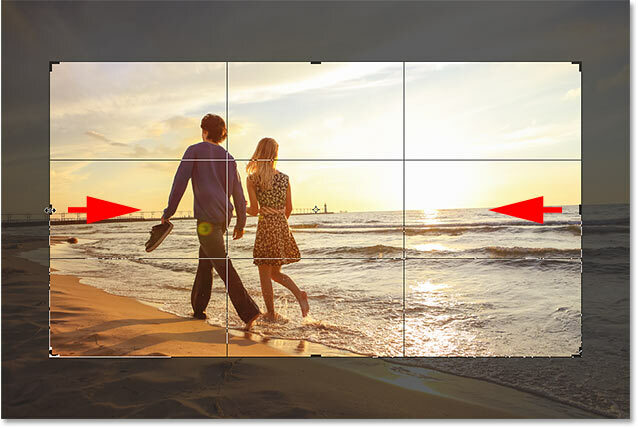 The Crop Tool makes it easy to add a border around your image. And there we have it! 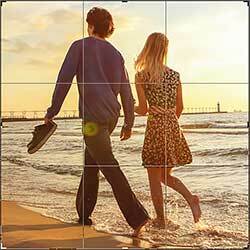 That's some tips and tricks you can use when cropping images with the Crop Tool in Photoshop! In the next lesson in this chapter, I show you how to use Photoshop's Perspective Crop Tool to both crop images and fix common perspective problems at the same time!